For drugs with low solubility or bioavailability, Capsugel offers a wide range of formulation options and technologies that maximize the opportunity for development and commercial success of drug candidates. The spray-dried dispersion (SDD) technology offered by Capsugel was pioneered by Bend Research. Capsugel Bend now serves as our Center of Excellence for SDD research, technology, product development and commercial manufacture of spray-dried drug product intermediates. 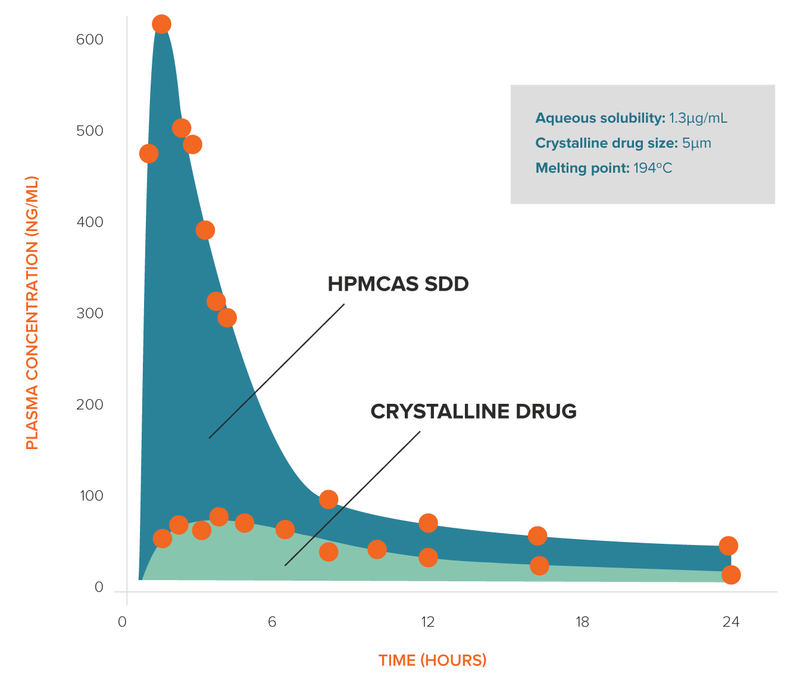 SDD technology serves as powerful formulation tool to enhance the bioavailability for compounds with low solubility — a problem encountered with an estimated 60-90 percent of compounds in early development. Our proven track record with SDDs over the past 20+ years makes us an ideal partner for advancing low-solubility compounds. We have developed and advanced more than a thousand SDD-based formulations working with biopharmaceutical customers around the globe. Our Rapid Advancement Process, which utilizes predictive model-based approaches to formulation, stability assessment and process definition, minimizes development time and API usage in the feasibility assessment stage. An SDD is a single-phase, amorphous molecular dispersion of a drug in a polymer matrix. It is a solid solution with the compound molecularly "dissolved" in a solid matrix. As the name suggests, SDDs are obtained by dissolving drug and polymer in an organic solvent and then spray-drying the solution. The formulation and process conditions are chosen so that the solvent quickly evaporates from the droplets, allowing insufficient time for phase separation or crystallization. In addition to their proven performance in enhancing solubility, SDDs have demonstrated long-term stability, facile scale-up and excellent manufacturability. Capsugel has unparalleled capability and experience in designing and formulating compounds as SDDs. Hundreds of compounds have been developed for in-vivo testing and advancement to clinical Phase I, II and III. Proven capability in scale-up and commercial scale manufacture of compounds as SDDs is in place and under expansion. Ultimate "manufacturability" of SDD-based compounds is accounted for early in the design and formulation development phases to ensure robust commercial finished dosage forms. Shelf-lives of more than 2 years have been consistently demonstrated with SDDs. Validated physical-stability models allow reliable identification of stable formulations from short-term data. SDD manufacturing has been reproducibly demonstrated at scales from milligrams to metric tons, with the science of scale applied in developing micro-scale methods in SDD manufacture and dissolution testing. Our SDD equipment range supports formulation screening through late stage clinical and commercial supply using current Good Manufacturing Practice (cGMP) and non-cGMP processes. Process development, technology transfer and scale up are successfully achieved using a comprehensive set of experimental tools and fundamental models. Our methodology results in low bulk-drug requirements for early-stage testing and rapid turnaround times to support fast-paced projects. Ready to enhance bioavailability and the delivery of your solid dosage form? This article will broadly describe a model-based SDD product development methodology as well as a control strategy that is based upon fundamental understanding of the formulation and the process.